Rustic and dignified; the Trestle Dining Table and 2 Bench Set will contribute to an exquisite place to entertain both indoors or outdoors. This amazing country dining set is made completely out of recycled teak; guaranteeing that each piece is unique with slightly different tone, adding to the whole country style and picturesque look. The Trestle style is chunky. 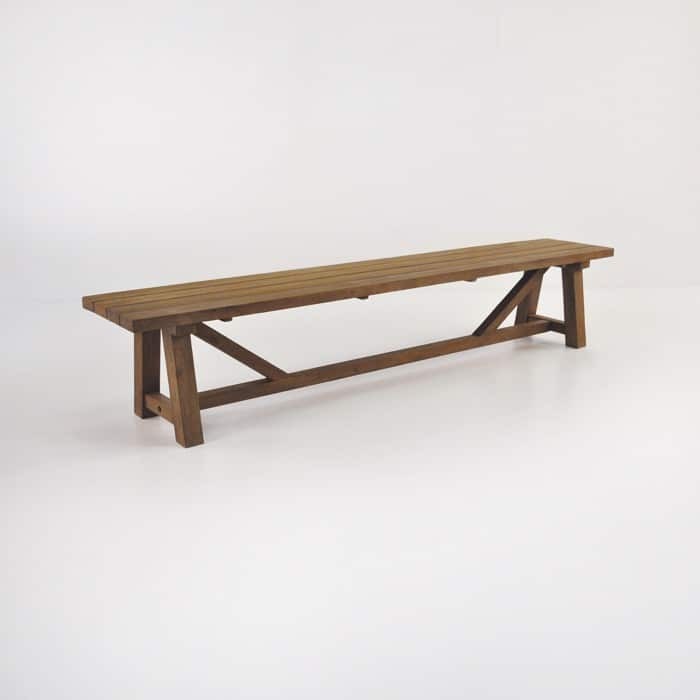 Huge planks of this recycled wood form the tabletop and seat with a thick trestle style base. The look is extraordinary, and a popular one here at Design Warehouse. Rustic and dignified; the Trestle Dining Table and 2 Bench Set will contribute to an exquisite place to entertain both indoors or outdoors. 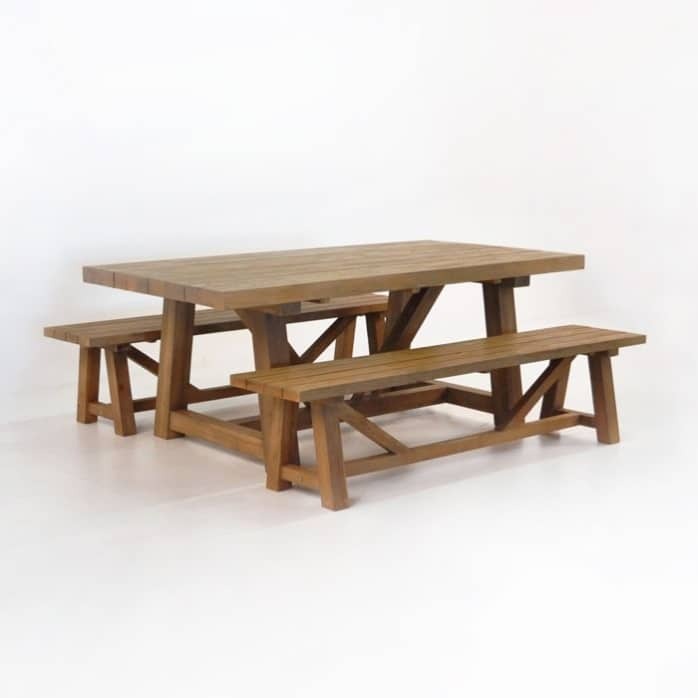 This amazing country dining set is made completely out of recycled teak; guaranteeing that each piece is unique with slightly different tone, adding to the whole country style and picturesque look. The Trestle style is chunky. 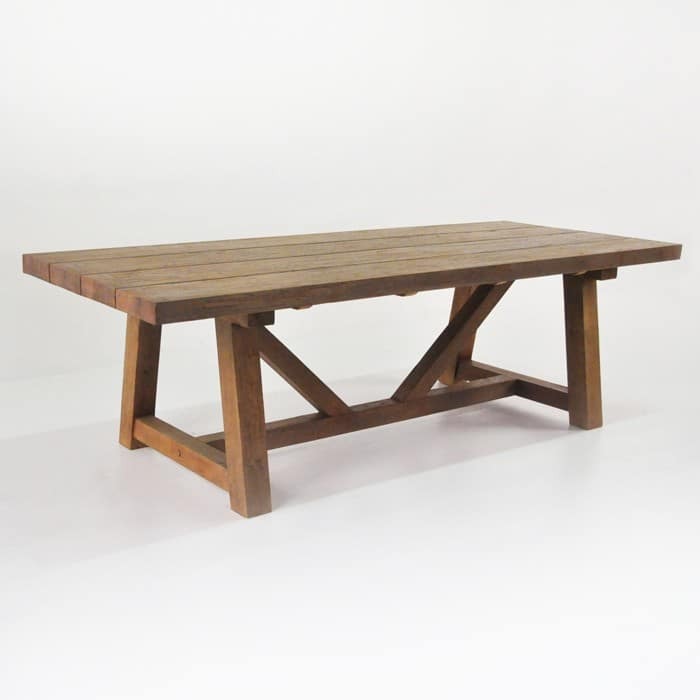 Huge planks of this recycled wood form the tabletop and seat with a thick trestle style base. The look is extraordinary, and a popular one here at Design Warehouse. This Trestle Dining Table and 2 Bench Set is made up of a 2 x 1 Trestle Table and two 1.9m Trestle Benches; however both are available in three sizes, so you can create an even more grand space to host your friends, should you like the look but need to go bigger. Did you know that our reclaimed teak comes from Indonesia? It is sourced there, processed and cleaned before it is restored and made into beautiful new pieces of outdoor furniture. As with our Grade A Teak, which is plantation from Indonesia, we source from Java to make sure that standards are kept and we are bringing to you the top quality. We are focused on quality first at Design Warehouse, which is why we’ve remained the top choice for outdoor furniture in New Zealand for over 20 years. Check out our client page while you’re here! We also supply to many cafes, restaurants, hotels, resorts and spas both here and internationally. You’ll be impressed by the vast range of people who trust in us and our product. Our country dining set is an incredible choice for a modern home. Imagine this Trestle Dining Table and 2 Bench Set within your stark white dining area, doesn’t the tone of it just invite comfort and comeliness? We think so. Add a couple of comfortable arm chairs at either end and you’ll be in dining heaven! Place outdoors either in a garden, a patio, out on a verandah – wherever you want to add a rustic, textured element to your space! If you don’t fancy benches, why not sub in some chairs instead? Keep it modern with wicker and steel, or go for a stunning romantic look with one of our intricately woven All Weather Wicker chairs. All our products are marine grade, quality tested to ensure that our outdoor furniture will withstand the harsh New Zealand sun and the tumultuous winter months. Call us today to find out more!